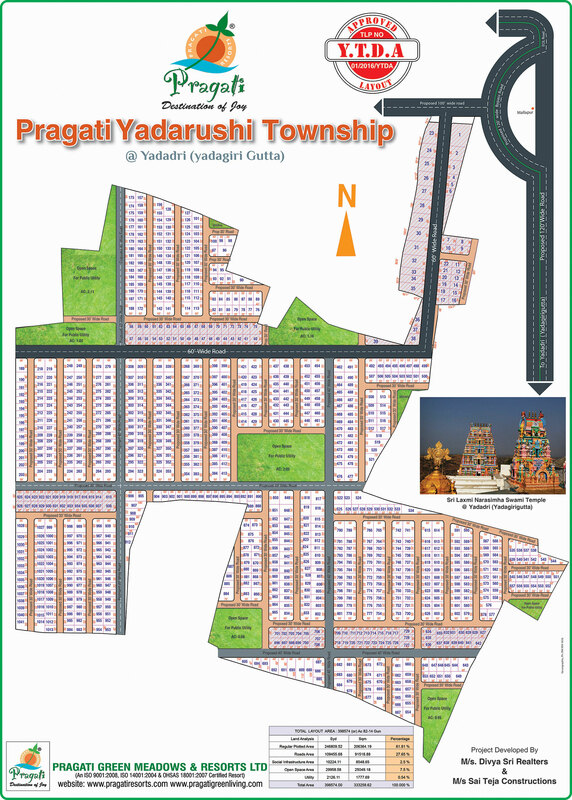 Pragati Yadarushi Township at Mallapur in close proximity to the popular Hindu temple of Lord Sri Laxminarasimha Swamy temple or Yadagirigutta (Yadadri) is Pragati Group’s latest open plot venture sprawling over 125 acres presents bright prospects for investment as well as to construct your own independent house. Abutting Warangal highway and in proximity to landmarks like the proposed MMTS and Railway hub, Infosys SEZ near Singapore township at Pocharam and the AIIMS at Bibinagar Pragati Yadarushi gives you a promising opportunity for handsome returns considering Telanagana government’s development plan in Uppal to Waranagal region. • 60', 40', 30' wide roads. • Street lighting & Underground drainage system.